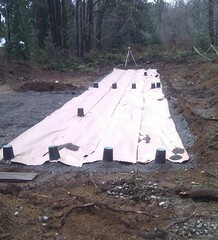 Click on the image below to start a slideshow that shows the full installation sequence of a fully certified onsite waste water treatment system (septic system). Caravan Pacific designed and installed this system in June 2011 for a happy customer in Port Alberni, BC. The full installation sequence of another fully certified onsite waste water treatment system (septic system) is shown below. Caravan Pacific designed and installed this system in Port Alberni, BC in June 2011. The slideshow below shows the construction sequence of another fully certified onsite waste water treatment system (septic system). Caravan Pacific designed and installed this system recently for a client in Parksville, BC. The slideshow below shows another recently completed project in Parksville, BC. 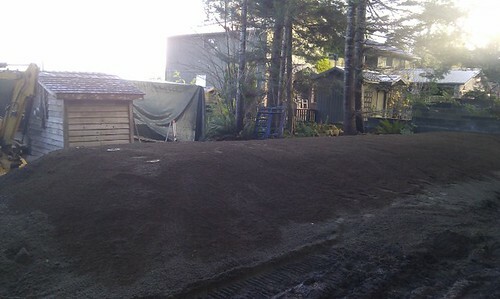 The photographs below were taken during the construction of the sand mound for a fully certified septic system. Click on the images to display a larger version.